Jennifer and Amy here today! We wanted to share with you about ONE simple solution that can really pull a home together. As we spoke this week about a client who wants to make her home feel bigger and more connected, we had a handful of ideas about how to accomplish this for her. However, there was ONE solution that stood out from them all. We wanted to invite you in on that conversation to reveal what we came up with! I can understand the challenge of having plenty of space. Because my home has a more traditional layout, it can feel like a collection of not-big-enough spaces. I have three boys under the age of 7 and we have 3,500 square feet of house, yet it can feel small. It's not small, but it feels small. Besides the fact that my kids like to be in the same room as I am and we fill those spaces with people, volume, and energy fast, somehow even when the boys are off in their own far corners of the house, we all feel like we're in our own small places. This photo is a pretty accurate depiction of the scale of energy in my house. Yet, we don't necessarily want to solve the challenge of having several dedicated spaces with an open layout. As much as increased openness could help us out, open layouts come with their own issues. Bigger open spaces can feel cavernous, offer limited privacy, and cause longing for places of intimacy. There are design solutions that can temper the disadvantages of open spaces, but there is another simpler solution. Yes! One surprisingly simple fix can be found by looking at your flooring. How many different types of flooring do you have from room to room? When working with our client just last week, we were faced with a similar challenge of not-small, but feels-small space. They want a clean, open, and bigger feel with better flow, but were struggling to make it work they way they wanted. As we discussed options for how to create that feeling of more space, it dawned on us. This is a genius solution for creating visual coherency and the illusion of more space. How? When your flooring is broken up and changes between every space: entry, living, dining, kitchen, hall, office, bedroom - for one, it can be visually exhausting AND it draws lineation between space. By removing those dividing visual lines, rooms can breathe. You don't feel like you have to stay within the lines when your flooring simply continues from one room to the next. 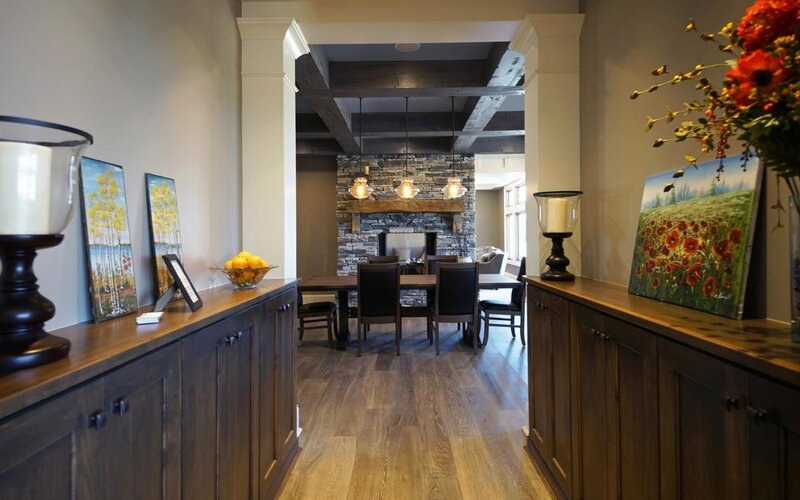 For our clients, we connected their space by using wood flooring throughout their home. Where they needed softness and quiet, we added rugs, where there was potential for water and moisture, we made visually sensitive floor transitions to stone or tile, but everywhere else, we stuck with the same engineered wood flooring. We stress this often, but it's such an overlooked part of the story when making improvements to interior space that it's worth repeating. If you do all the hard work of connecting and unifying your space, but slack on light, it will still. feel. small. In an effort to make your home feel more connected and spacious, be sure to make natural and interior light as high a priority in your unifying efforts as connecting your flooring materials. You’ll be so much happier with the results!